Overall the weekend looks pretty nice for the Castle Rock area, the forecast is posted above. Expect a chance of thunderstorms in the afternoon on Saturday, so remember to take the rain gear if you’re out and about. Another pleasant day follows on Sunday with temperatures in the 70’s under partly cloudy conditions. 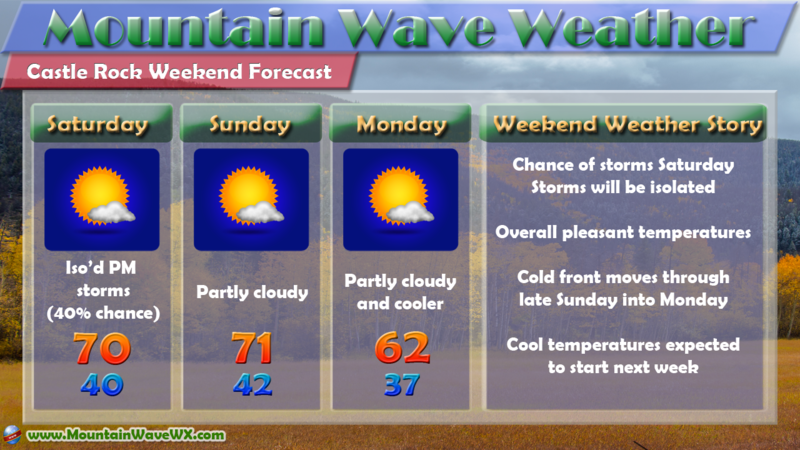 A cold front is expected to move through late into the overnight hours on Sunday and early Monday. Monday will feature breezy conditions with cooler temperatures. There is a slight chance for a stray shower but most areas will remain dry. Temperatures will remain cool on into Tuesday with model guidance showing highs only in the 50 on Tuesday!